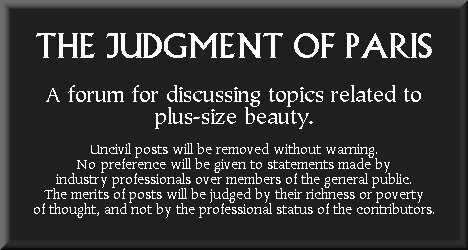 The poet tells us that "beauty is truth, truth beauty," and while we may wish to reserve a discussion of the deeper implications of Keats's insight for another occasion, the plus-size industry would do well to adopt this mantra as a guide in creating size-positive campaigns. Consider this lingerie image of Maiysha. According to some outdated notions about promoting plus-size fashion (outdated, but still regrettably operative in some circles), this photograph would require airbrushing to remove any so-called "flaws," such as a roll around the midriff. But Maiysha's spring/summer campaign for Lane Bryant deserves acclaim precisely because the company has not resorted to this approach, but rather, has presented her natural figure without any embarrassment. As Penningtons demonstrated with its current lingerie promotion featuring Jeanna Lynn, which accentuates rather than minimizes her full thighs, an image such as this--which combines beauty and truth--can compel viewers to reconsider their lifelong aesthetic indoctrination. What in the world makes a roll around the midriff a "flaw," anyway? Rather than detracting from the model's beauty, her perfectly normal silhouette contributes to that beauty. the model has a soft, rounded stomach--not at all like the typical Sports Illustrated waif. And again, one must ask--how in the world could anyone consider this feature a "flaw" of any kind? If one browses through the millennia-long artistic legacy of the West, one is hard pressed to find an image of a woman who does have flat stomach, and who does not have a "womanly tummy" (to use Mia Tyler's phrase). It staggers the imagination to consider just how much healthier our society would be, if the images of women that surrounded us every day were beautiful and truthful, like these photographs of Maiysha and Kaila, rather than artificially emaciated. This is one of the principle reasons why we have always rejected the outdated notion that plus-size models need to be "toned," or have "flat stomachs," or any of the other supposed "rules" about plus-size modelling that arose because the industry applied straight-size standards to the full-figure category. Not only should plus-size models not be bound by those rules, but in fact, they should be at the forefront of the movement to reject those rules as unnatural, and to produce images of women that are both truthful . . . and beautiful.